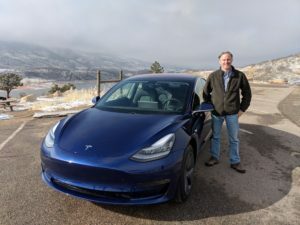 One of the most hotly-demanded cars of all time is finally starting to make its way to Northern Colorado and according to Patrick Mahoney, one of the first Model 3 owners in the area, it lives up to all the hype. But don’t just take Patrick’s word for it. His 13-year-old daughter agrees, “If I were to imagine a car in the future, it would be like this.” The following interview with Patrick provides an overview of his experience so far with the newest EV on the market. DENC: How did you decide to order the Tesla Model 3? Patrick: I have long been a fan of Tesla as a company, but the price of the cars always seemed a bit out of reach for my financial situation. In 2014, I was with my father when his Ford Fusion Plug-in hybrid was sideswiped and totaled, and when he looked for a replacement I suggested he replace it with a Tesla Model S. At first he wasn’t convinced, but I talked him through a bunch of his concerns and finally said, “Dad, just go and sit in one and maybe take it for a test drive.” Once he got in the car, he was convinced, but once he went into “launch mode,” he was sold. He loves his Model S and I was contemplating getting a used one right around the time I first heard about the Model 3 and decided instead that the Model 3 would be my next car. I called up my parents and asked them to go with me on March 31st, 2016 to line up at Park Meadows Mall in Denver at 6:30am to put down $1,000 for a reservation on a Model 3 when the store opened at 10am. DENC: What was the delivery experience like after waiting almost 2 years? Patrick: The funny thing for me about seeing a Model 3 in person is that after a year and a half of reading everything I could about the car and watching all of the detailed YouTube videos is that seeing it in person is more like a reinforcement of things you already know and have seen. It’s a lot of “Oh, yeah, I thought it would work like that.” and “Wow, that glass roof is just as gorgeous as I thought it would be.” There was almost nothing that was a surprise and yet I was completely pleased with everything about it – even the lack of a dashboard display. The purchase experience went very smoothly and I felt like I was in a bit of a daze throughout. DENC: What were your first impressions of the Model 3? Patrick: The car itself looks like a sleek, gorgeous driving machine. My previous car was a Toyota Prius and so in every respect except maximum range, the Model 3 is a huge improvement. From the moment I saw it on the reveal I loved it, but when I first saw one in person I thought, “It looks even better in person than on video.” This is something that I’ve heard several people say. The door handles work exactly like I thought they would and it’s easy to open the door if you know how to. However, the door handles aren’t intuitive to the uninitiated and so one of the things that takes some getting used to is when you hop in the car, your passenger will likely be stuck outside staring at the door in consternation. The Model 3 also feels surprisingly open and airy. The forward-shifted seat combined with the large windshield, the glass roof, and the lack of a instrument cluster make the car feel bigger than it really is. The steering wheel has a nice heavy sort of heft to it and the seats are comfortable. In a marked improvement over the Model S, there are lots of little cubbies for personal items and there’s a very nice spot under the center display to charge phones. There are also lots and lots of cupholders. The display/control panel is the next thing I noticed—it feels very fast and responsive—another notable improvement over the Model S and X.
DENC: How is the driving experience? Patrick: The driving experience is great. I sort of knew that going into the purchase because Car and Driver and Motor Trend both gushed about how well it drives. I don’t have extensive sports car driving experience, but I’ve driven a couple of Porsches over the years so I can say with limited authority that the Model 3 provides an exemplary driving experience. It corners like a sports car and feels solid and powerful on the road. The acceleration has a small amount of initial hesitation and then pushes you back in the seat. It doesn’t feel as powerful as the Model S, but it’s more than sufficient for everyday driving. Merging onto the freeway is just a matter of picking your spot and then you are where you need to be seemingly effortlessly. 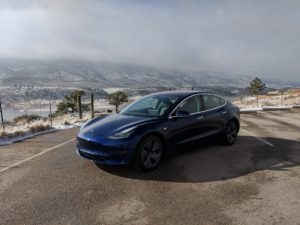 DENC: How does the Model 3 compare to other EVs you’ve driven? Patrick: When you take your foot off the accelerator, the regen braking is not as strong as the Bolt but it’s just about enough to take the car to a complete stop moderately quickly. 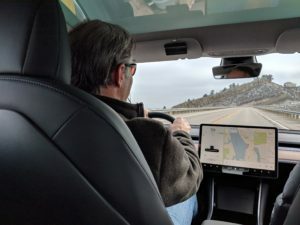 You don’t need to use a brake most of the time—which, in my opinion, is not quite as cool as the Bolt’s one-pedal driving where you more or less never need to use the brake pedal, but the system on the Model 3 is good enough most of the time. And then “creep” or how much the car moves when your foot is off both pedals can be set in the menus, but I have it set to “no creep” and that seems good enough. DENC: What are some of your favorite features on the car? Patrick: I walk up to the car and it wakes itself up like some futuristic AI-powered spaceship. Then I drive, get out, and it shuts off when I get about a dozen feet away. The autopilot is another magical feature. It has a bit more of a tendency to wander across the lanes than I might have hoped but it seems to work well and I trust it and am pleased with it. DENC: Is there anything you don’t like about the car? Patrick: The things I don’t like are few and minor. I wish the heater got warmer. I wish the rearview mirror was a bit bigger. The biggest issue is that using the center touchscreen for everything is a bit distracting. People say it isn’t, but when I’m trying to change the radio station, my eyes aren’t on the road and it is more distracting than using traditional dials. I really wish Tesla would come up with some multi-touch gesture control system—like something where you could change the station just by simply swiping multiple fingers across the screen anywhere on the screen without looking. I think the solution will include voice control, but for now the voice control doesn’t even seem as good as Apple’s Siri, and that’s a pretty low bar. Patrick: Overall, I am totally thrilled with the car. From the roof window to the way it drives to the high tech features it includes to the bluetooth key which automatically turns on the car when you get close, it simply seems magical. I know there are a whole lot of people waiting for this car with varying degrees of patience and that I’m one of the very lucky early owners, but the thing that I can say is that the wait is worth it, at least to me. I imagine the $35,000 version of the car won’t have all of the features of the premium long-range version that I purchased, but it still seems to me like it will be an amazing car for that price.